What gun would you carry with enough firepower to keep your family and yourself safe from a menagerie of threats? While micro-compacts are comfortable and easily concealed, they’re usually chambered in anemic calibers with low-round capacity. What we need is a small pocket pistol chambered in a potent caliber with enough firepower to complete the job at hand! A gun we want to carry 365 days a year with confidence! But how, Tank? The folks at SIG SAUER have come to the rescue with the newly released P365. 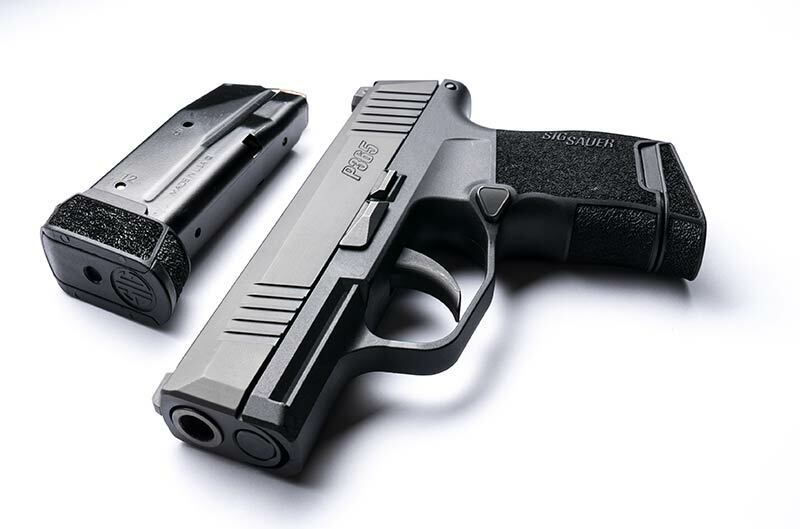 The SIG SAUER P365 is a high-capacity micro-compact pistol chambered in 9mm and the answer to our dreams. What else would you expect from a company rooted deeply in German engineering and Swiss precision? These traits differentiate the P365 from all the other micro-compacts on the market. The folks at SIG SAUER designed a magazine capable of holding 10+1 9mm rounds, while still maintaining a 1" profile using a new geometrically shaped, patent pending, narrow necked, double-stack magazine. This magazine makes all good things possible! An optional 12+1 magazine with extended finger-grip bottom is also available. Wow! With such a high-round capacity, surely the SIG SAUER is bigger and heavier than its competitors, right? Negatory, there, pistol-packing buddy! The P365 weighs a mere 17.8 oz., empty and has a gaunt 1" profile, making it smaller and lighter than most in the micro-compact class. It’s 5.8" long and 4.3" tall, and sports a 3.1" barrel. The P365 is a striker-fired, polymer-framed design, providing a good grip-to-bore axis, which lessons perceived recoil, for such a lightweight gun. The fully textured grip has a slim-line rail for SIG light or laser accessories. A generous trigger-guard undercut encourages a high hand position for a solid, steady grip. The narrowed magazine top allows for an ergonomically designed grip-shape to perfectly fit the shooters thumb-web. The stainless steel slide has front and rear serrations for positive grip during slide manipulation and press-check. SIGLITE front and rear sights are included and provide a sharp sight picture and fast target acquisition during low-light conditions. Safe and easy disassembly is possible with a 3-point takedown and does not require the trigger to be pulled while doing so. The SIG SAUER P365 may just be the most comfortably carried, high-capacity pistol in its class made today. The 10+1 and 12+1 extended magazine capacity is impressive for such a small, affordable package! Check one out, you’ll be glad you did. Whether professional or civilian, the P365 has a lot of pluses, namely capacity, minus the weight and bulk of conventionally sized shooters. The SIG SAUER P365 has an MSRP of $599. For more info, https://www.sigsauer.com/; SIG SAUER, Ph: (603) 610-3000.